The American Association for the Advancement of Science (AAAS) named Ocean Sunlight: How Tiny Plants Feed the Seas (Blue Sky Press, 2012) by Molly Bang ’65 and MIT's Professor of Biology Penny Chisolm, the Best Children’s Science Picture Book of 2012 in its AAAS/Subaru Science Books & Films Prize for Excellence in Science Books. Bang and Chisholm also won in the Children’s Picture Book category in 2009 for their previous collaboration, Living Sunlight: How Plants Bring the Earth to Life. According to the association, the prize (in four categories) celebrates outstanding science writing and illustration for children and young adults. The prizes recognize recently published works that are scientifically sound and foster an understanding and appreciation of science in young readers. Acclaimed Caldecott artist Molly Bang paints a stunning, sweeping view of our ever-changing oceans. In this timely book, Bang uses her signature poetic language and dazzling illustrations to introduce the oceanic world. From tiny aquatic plants to the biggest whale or fish, Bang and Chisholm present a moving, living picture of the miraculous balance sustaining each life cycle and food chain deep within the oceans. “I am your sun...All ocean life depends on me; so does all life on land.” Thus begins the clear explanation of the role of the sun in photosynthesis on land and seas as the ocean’s role in the food chain is introduced. 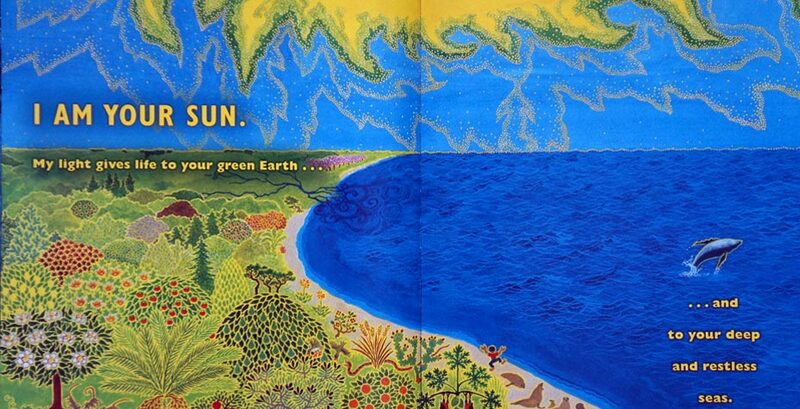 Subsequently the reader is introduced to “the great invisible pasture of the sea,” phytoplankton. Bang uses somewhat complex page designs to deliver considerable information about the way the ocean works, continuously creating a strong sequence of aesthetic images. She often uses multiple frames to isolate specific interactions, while retaining an overall sense of unity. There are extensive additional notes to aid understanding. The book has also been given a Riverby Award for excellent natural history books for young readers by the John Burroughs Association this year. We (and countless young readers) are glad she did!